Since you’ve not got much time before the big day, we’re listing our favourite Christmas hampers here – all priced at less than £50. 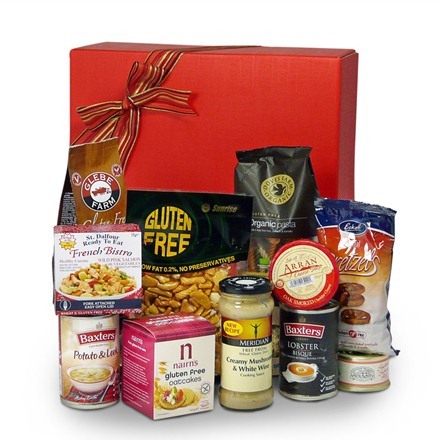 Take a look and order your festive gluten free Christmas hamper today. 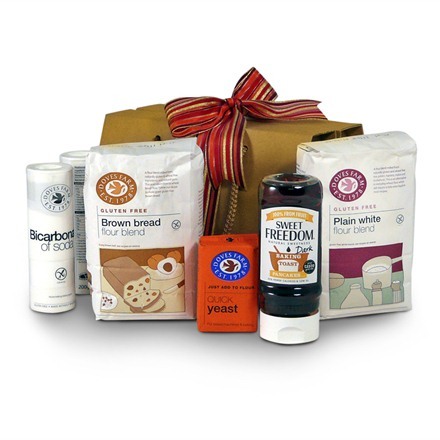 The Savoury Selection Christmas Hamper is a scrumptious collection of gluten free oat cakes, Arran oak smoked cheese, scrumptious soups and cooking sauces as well as gluten free cooking sauces, pastas and nibbles. Attractively presented in a festive details with a hand tied bow and personalised gift card, it’s great for that special someone who likes to add a bit of flavour-filled crunch to their day. Gluten free doesn’t mean cake free. There are loads of fantastic gluten free backing recipes out there. The Baker’s Gift Box provides you with all the tools you need to make fabulous bakes in your own home. Packed full of the finest festive gluten free treats the Sweet and Savoury Christmas Hamper will wipe away any frustrations you may have at all the unsuitable foods on offer at the Christmas buffet. It includes scrumptious biscuits and cakes, as well as savoury nibbles too making it the perfect accompaniment to a family Christmas. Because we hand pack our hampers to order you can add a little something to your chosen hamper to make it extra special. And remember to let us know what you’d like written on the personalised card we place inside the hamper too. 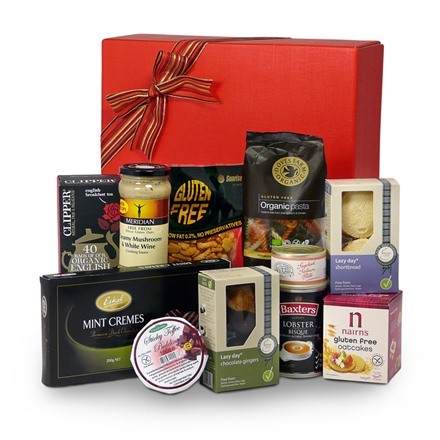 We can send any of these Christmas hampers within the UK and overseas. Find out more about last shipping dates here. If substitutions are required we will ensure that they are to the same (or higher) value and compliment your original selection.